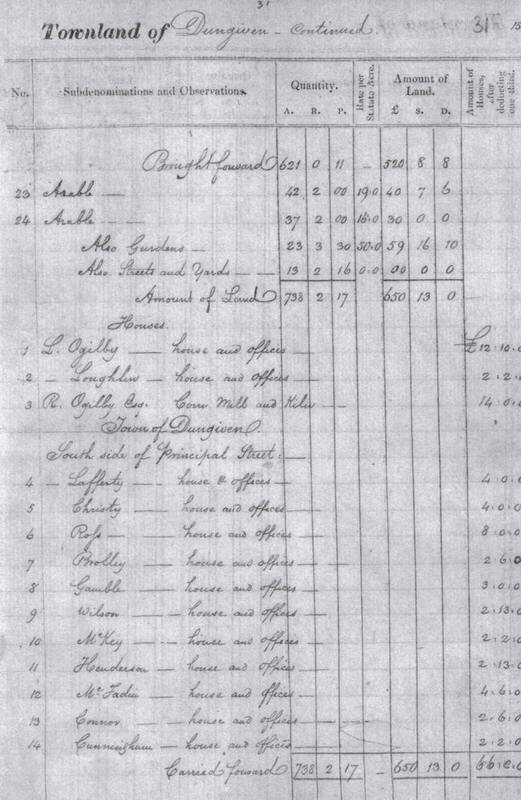 The valuation of the streets in the town of Dungiven took place in January/February 1832 and the results were recorded in books which survive in manuscript format. Here you can see the pages from one of these books [PRONI ref. VAL/1B/518A] for Main Street, Dungiven. The numbers against the properties in each street correspond to the numbers on the 1834 Valuation Map of the town. Unfortunately there appears to be no detailed information on the age, condition and dimensions of individual houses within the town. Note that the houses belonging to the Ogilbys and Loughlin on the page below lay outside the town. Note that I have databased the names and streets for the entire town - Excel & PDF versions available on the main webpage.